Developed from a European wild cabbage, broccoli is a member of the cruciferous family of vegetables. Ancient Romans and Italians have cultivated broccoli for over 2,000 years. Italian immigrants first introduced it to the United States during the colonial era. After the development of Italian language radio advertisements in the 1920s, broccoli grew in popularity and became a staple in many American kitchens. Broccoli is one of the most nutrient-dense foods. A one-cup serving of broccoli has the same amount of protein as one cup of corn or rice, but with less than a third of the calories. Broccoli is rich in vitamins K, C, and A, as well as folic acid, fiber, phosphorus, potassium, and magnesium. It also contains phytochemical glucosinolates and the carotenoid lutein, both of which are effective at fighting cancer. A 3 1/2 ounce serving of broccoli has only 35 calories. Studies have shown broccoli to be particularly effective in preventing breast cancer, as the glucosinolate sulforaphane found in broccoli helps to increase estrogen. Broccoli is rich in indole-3-carbinol, which prevents the growth of both breast and prostate cancer cells. Indole-3-carbinol also increases the liver’s ability to detoxify toxic compounds including the human papillomavirus, which is linked to the development of cervical cancer. 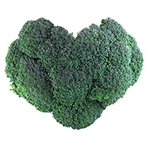 Broccoli also contains high levels of lutein, which helps prevent macular degeneration. Broccoli can be eaten raw or cooked, hot or cold. Great as a classic crudité at parties, or added to an omelet, broccoli is appropriate for every meal and occasion. Try pureeing cooked broccoli, and adding seasonings to taste for a delicious and healthy soup. What is your favorite broccoli recipe?